How about getting the day off to an extra special start by being collected in style and whisked off to Disney's Contemporary Resort for an unforgettable banquet with Mickey, Donald, and the rest of the gang?! 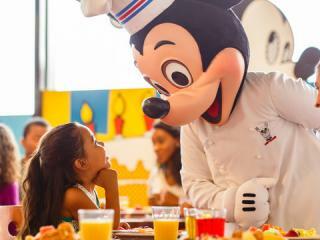 The Disney VIP Character Breakfast (or Brunch on select days) with Limousine Transfers includes return transfers from your hotel in a 5-star stretched limousine, an all-you-can-eat breakfast and the chance to meet some of your favourite Disney Characters. Keep you cameras handy as the characters will mingle with you throughout, pose for photos, sign autographs and even periodically lead diners in song and dance! So delight in the revelry, soak up the expansive views of Bay Lake, and behold the stunning 90-foot-high mural by Disney Legend Mary Blair that overlooks the festive eatery. The schedule alternates between a Character Breakfast and a Character Brunch - check the calendar above to see what's available on your chosen day. While there is no difference between the two in terms of content/menu, they run at different times of the day. Breakfast: This takes place at either 7.55am, 8.10am, 9.55am or 10.05am. The exact time cannot be guaranteed, but will be reconfirmed locally 72 hours in advance of your experience. Brunch: This takes place between 10.30am and 1.30pm. The exact time cannot be guaranteed, but will be reconfirmed locally 72 hours in advance of your experience. After your experience you will be met at and returned to your accommodation or you have the option to use the Disney Monorail System or be taken to Universal CityWalk for easy access to Universal Studios or Universal’s Islands of Adventure. Due to the popularity of this excursion, we strongly recommend booking in advance to avoid disappointment!